What do you get when you pair a minimalist such as Jim Jarmusch with a genius cinematographer in Christopher Doyle? The answer is a stunning work of art, starkly beautiful in its compositions and intelligently obtuse in its storytelling. Much like the director’s other films for which I’ve had the pleasure of seeing, The Limits of Control is about one man’s spiritual journey. Sometimes his movies have a more straightforward focus in plot, (Ghost Dog or Broken Flowers), but other instances are more metaphysical and open to interpretation, (Dead Man). His newest most definitely falls into the latter category, taking us on the job with Isaach De Bankolé’s Lone Man. It is a criminal deed for sure, yet its scavenger hunt progression contains overlaps, motif repetition, and layering that insist part of what we are seeing is all in his head, allowing for the question of what is real to be a valid one. Is the insanity seen through a schizophrenic’s eyes any less real than the supposed reality of a sane man? Isn’t it just truth through a different colored lens? Jarmusch plays with constraints of society and what we deem as acceptable, showing that maybe we look too hard without truly seeing. Control in and of itself describes either being at someone’s mercy or setting the rules for everyone else—either way, the limits are many. We can go through life as though we have a set standard to work towards, sheltering ourselves to a regimented path that is out of our hands. However, we must be in total control in order to stay true along that route, never allowing outside forces lead us astray, living a controlled existence that leads to an uncertain future constructed by what those around us say. On the flip side, if we go where life takes us, unhindered by preexisting rules, we are given an infinite amount of choices. So, by throwing caution to the wind and walking nomadically against what our families and friends see as success, we in fact give ourselves more control—the control to say no, to say yes, or to say nothing; a decision that’s ours to make. The Lone Man in this tale is an enigma that lives his life in both worlds, following the clues and system set up by his employers, yet keeping to his own rules and routines. While he has to wait three days for his next drop off, what he does in that time is completely up to him. His job takes him to exotic worlds ripe for exploration, giving him an experience uniquely his own. This film is so utterly mesmerizing in its ability to be so opaque despite its rather linear structure. The Lone Man is given instructions to follow and matchboxes to exchange, meeting a colorful cast of characters along the way as messengers to the cause. We watch how it all progresses to its inevitable end point, leading him to and fro until his final destination arrives. Yet there are so many questions left unanswered along the way. What are the codes written on each piece of paper that eventually finds its way to his mouth, soon washed down with espresso? Are they part of the Spanish museum’s card catalog, leading him to artwork that eerily foreshadows the future? Why are stringed instruments so important, both physically in their existence within cases and figuratively with necklace charms and even a garrote? Why always two cups of coffee? Why the prevalence of certain quotes? The Lone Man’s quest begins to eventually cycle through to a point where aspects from the past seep into the present, whether it be a contact arriving onto a movie poster or the constant noticing of a woman somehow stuck to the center of it all, (Paz de la Huerta who now has been pretty much naked in the entirety of both films I’ve seen her in). Nothing fazes him, however, he just continues on. It is all very abstract to the point where I began to believe nothing actually happened, that perhaps it is all in his mind. Maybe his mission is to destroy technology and its impact on humanity, making all interactions we have impersonal and unimportant. Mobile phones are explicitly forbidden in the Lone Man’s world while the works of man—paintings, buildings, etc—created far from the time of computers hold his unwavering gaze at every turn. This bohemian is caught within his own imagination, stealthily working his way through his mind until he can surprise and destroy the part attempting to excise his creativity. I’m sure you could watch and re-watch The Limits of Control over and over again, eventually coming up with a thesis to explain it all, but perhaps that’s grasping too hard at needing control over what you’ve seen. Sometimes not knowing, yet still enjoying for the sake of its actual existence, is enough. No explanation could increase or decrease my enjoyment of this film; it hits on a completely visceral and interior level, engaging the brain and senses, acting as visual poetry washing over me. De Bankolé is the epitome of cool as always; his stoicism breaking into a few smiles along the way, constantly in control of his body with meditative martial arts while freeing his mind to take him wherever it may. Dolye shoots it all from exquisite angles and perspectives, framing the magnificent architecture of Spain as a series of static masterworks for the characters to walk through. Every other role is miniscule at best, but ever so crucial to the tale at hand. Reminiscent to Jarmusch’s Coffee and Cigarettes, each exchange occurs at a table with two cups willing to be consumed. The people coming in and out during these conversations wax philosophically about perspective and the meaning to it all, only exiting when the Lone Man takes out his matchbook. Although set up as a suspenseful tale of nefarious dealings, the film is infused with humor at every turn, from the opening scene of translation to the deadpan activities of characters throughout. Bill Murray, Tilda Swinton, Gael García Bernal, John Hurt, Luis Tosar and others work wonders in their semi-emotionless delivery, every word of utmost importance in cracking the case that is this film and, in all actuality, film itself. Throw in a riveting sequence of Flamenco, a haunting score, and even a memorable song playing during the end credits and Jarmusch has definitely crafted another master work of genius—out on the fringes of the industry as always—like only he can. 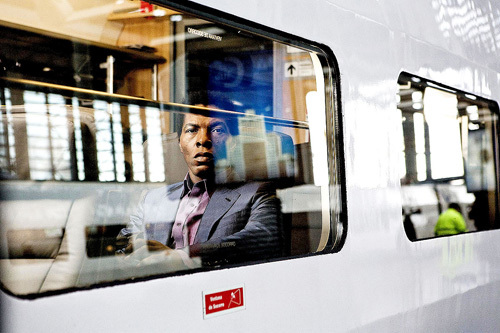 Isaach De Bankole in Focus Features’ The Limits of Control (2009). Photo credit by Teresa Isasi. Copyright © Focus Features. All Rights Reserved. 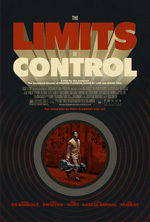 Tilda Swinton in Focus Features’ The Limits of Control (2009). Photo credit by Teresa Isasi.